I remember when I first started loving comics. I also remember when I started hating comics. I’m trying to just like comics again. The first comic book I ever read was Marvel’s G.I.Joe. My parents had given me a few dollars at a local fair. I wandered around trying to find something to buy, the money burning a hole in my pocket. Under a small tent was a booth with comics new and old. I picked an issue off the rack and bought it. My uncle had a trailer at the fair, where he was selling pumpkins painted with goofy faces and red noses. As I sat in his trailer reading it, I was instantly hooked. I think I went back to that tent two or three more times, buying one or two more each stop. The first job I ever had was in a comic book shop at age thirteen. I was too young to be paid cash, so I was paid in comics, a setup that suited me just fine. Friday was new book day. I would help bag all the new comics (cover priced at just 60 cents!) and fill the customers’ files with the books they requested each week. At the end of the day, I would take my own new books and ride my bike home. Thus began my comic book collection. Issue 21 of G.I.Joe made me love comics. It was the silent issue featuring the revelation that both Snake Eyes and Storm Shadow had matching tattoos. Frank Miller’s Batman: The Dark Knight Returns made me love comics. I remember the day we opened the box of new books from the distributor, and sitting on top was the first issue with its iconic cover of a silhouetted Batman and lightning striking in the background. The other kid and I just stared, our jaws on the floor. He lifted the issue from the box like Indiana Jones lifting the idol at the beginning of the first Raiders film. We had come upon something sacred and magical. Issue 78 of Cerebus made me love comics. A psychedelic dream issue where reality is stretched and oddly transformed. I had never seen anything like it and was mesmerized. 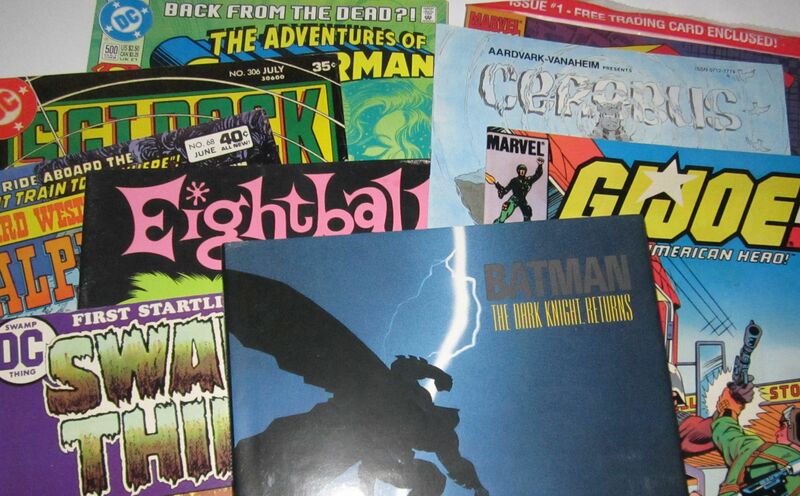 Finding or being given old comic books from tag sales and flea markets made me love comics. Different books like The Unknown Soldier and Weird Western Tales featuring Scalphunter. They were torn and tattered and smelled of a damp musty attic, and they were great. They were just a little bit older and slightly less politically correct than the newer books. It was as if I were reading something meant for adults. Lots of things influenced my love of comics. I began “collecting,” but luckily was too young to see the investment aspect. I knew it existed, knew old comics were valuable, but it wasn’t really on my radar or within my means. I would never be able to afford a copy of The Amazing Spiderman Number One. Hell, I never even got a copy of Daredevil Issue 158, which was considered “affordable” at the time. Why would I? I could buy a dozen new comics for the cost of one older comic. The first shop I worked in was eventually sold. The investment era was upon us. A chain outfit from somewhere down south named Big Bob’s bought out the previous owner, a super nice guy but terrible businessman. His most common phrase was “I have it, I just don’t know where it is.” This was true; he had most everything, but it was lost somewhere within his vast inventory. The shop went from a dingy, disorganized, chaotic mess to a cold, commercial, heartless entity. The walls were all painted bright yellow (Big Bob’s signature color), the cases were shiny and new, and professional shelving was installed. I continued to work there, seeing as I was practically part of the deal when it was sold. It was never the same, though. They even brought in sports cards! Sports cards in a comic shop? This was not a good sign. There is an old saying: “familiarity breeds contempt.” This is how I started hating comics. I had overstayed my welcome. I was too familiar, too close, had seen too much. The “investors” made me hate comics. They bought multiple copies of certain books and would complain if one tiny crease existed in the spine. One guy would come in with what looked like a shammy towel and lay each issue out like a precious antique (similar to how we treated The Dark Knight, but for the wrong reasons). The gimmicks made me hate comics. The Investment Era is also sometimes nicknamed the Chromium Era for this very reason. Chromium covers, hologram covers, die cut covers, glow in the dark covers, bagged issues, trading card inserts, all of it was hard to take. Death of Superman made me hate comics. Not that I cared that Superman died. I knew he wasn’t going to be dead long. That storyline combined the worst traits of the era in one neat little package. A gimmick for the investors and everyone else in the world. People I had never seen before came into the store asking for five or ten copies of the black-bagged book—a comic book you couldn’t even read! At one point the owner of the store took copies from the regular customers’ files to sell to strangers off the street, leaving loyal customers empty-handed. I worked at the shop a little while longer, but didn’t love comics anymore. I read less and less. The things that made me love comics were killed by what made me hate comics. On occasion, while in college I would visit the various comic shops of New York City in search of something to read. In was an exercise in futility. Little to nothing interested me, at least from the superhero side of things. Part of it was I was older and had different interests, but part of me still held a grudge against the big companies and what they had done by making comics into something to be put in a vault instead of scattered about the living room. I read Hate by Peter Bagge, Eightball by Dan Clowes, or other independent autobiographical-style books. I would purposefully treat the books casually, even badly, to remind myself they weren’t for investing or even collecting but for reading and enjoying. I want to like comics again. Not sure I will ever love them. Certain characters still interest me, mostly ones on the fringe like Swamp Thing, Demon, or Deadman, who exist on the spectrum of the supernatural. The movies help, too. Seeing larger than life characters done well on the big screen is pretty neat. They make me want to go back and find out their origins, although I’m not sure I’ll ever be a regular reader again. I would be more willing to give smaller publishers with new ideas a chance at my money than the movie studios. Chances are, next time I’m in a comic shop, I might look in the bargain bin for a well-read copy of Sgt Rock or Machine Man instead.